Army-Navy spirit spots have swamped various online-video platforms in recent days as the hype for Saturday’s game reaches its apex. We’ve got four of the more popular offerings below, with more on the way later in the week. Scroll down for some clips and critiques, and vote in our poll at the bottom of the page. Have a video we might’ve missed? Leave a link in the comments below. 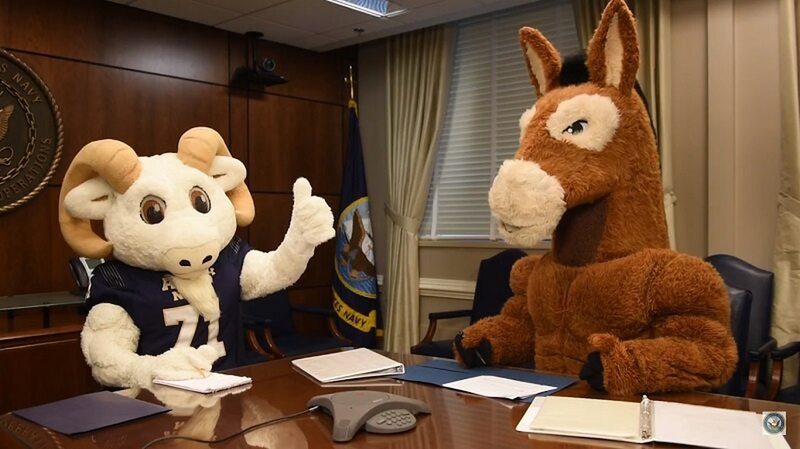 Premise: Bill the Goat and Blackjack the Mule gather for a critical teleconference with Army Chief of Staff Gen. Mark Milley and Chief of Naval Operations Adm. John Richardson. Connection issues, button-mashing and other hilarity ensues ... like most teleconferences. Positives: The mascots are in their element here, hamming it up with prop-fueled pantomime. Problems: A glaring oversight with the book exchange: How could Army’s leader neglect this tome on Naval Academy leadership? It’s a bestseller, after all. Premise: Ensign Rylan Tuohy, USNA grad and the man behind “Naptown Funk” and “We Give a Ship,” returns with his latest upbeat offering. Positives: Tuohy’s typical engaging, quick-cut style comes with an off-the-charts celebrity contingent: Sen. John McCain, Dallas Cowboys legend Roger Staubach, Navy Secretary Richard Spencer ... the only guy who didn’t give him a “Helm Yeah” was this guy. Problems: Given recent headlines, one could question the skywriting clip. Positives: From the camera of GI Film Festival entrant and spirit spot regular Austin Lachance, now a second lieutenant, this mini-movie comes complete with special effects, helicopters and a West Point Band-provided soundtrack. The cadet-fueled finale almost stands alone. Problems: For folks seeking simplicity in their spirit spots ― lampoon a commercial, or stick the CNO in a funny hat, or both ― we may be reaching a cinematic saturation point. Also, no War Tubas. Premise: The crew of the aircraft carrier Abraham Lincoln has a rivalry-week message, and they’ll get it out the best way they know how. Positives: A tight 60 seconds, a few sight gags and a big payoff proves that simple can be effective. Problems: The color-coded, labeled turtlenecks veer into the realm of henchmen from the 1960s “Batman“ television show. Not the type of person to emulate if you’re serving in a Global Force for Go ... oh, right.